I wanted to write a series of hopefully informative and helpful articles to speed the learning curve of paddlers new to the sport. The series of writings will focus on specific topics which I intend to explore in detail and will cover in parts. I have either been taught these things by more experienced paddlers along the way, or have learned through trial and error or in some cases, by happy accident. I hope readers will be able to avoid some common pitfalls and maximize their enjoyment of kayaking and time on the water. Anyone who knows me knows I can be quite obsessive and turn into a total Type A when it comes to organizing things. Good organization has been a part of my life since I entered the workforce at the age of 16 (it has bordered on Obsessive Compulsive Disorder more recently). I have found this skill to be especially helpful in my budding kayaking experience, especially while serving as an Officer with our local paddling club. Make a list. The sheer amount of gear needed for every trip can be quite long. 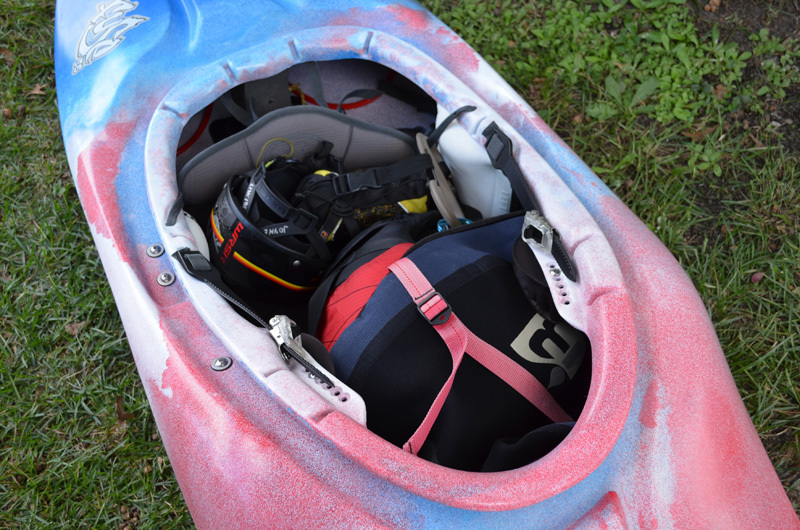 Especially when first start kayaking, it is easy to forget everything you do need. The list can grow or shrink as time goes on and you refine the gear you haul. 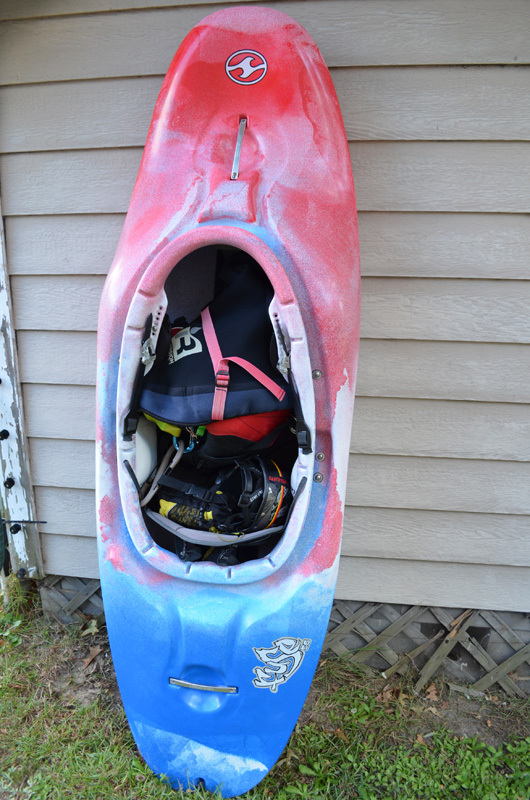 Nothing can be worse than driving for hours to go kayaking, only to discover you’ve left some valuable piece of equipment at home. Do yourself a favor, make like Santa; make that list and check it twice! 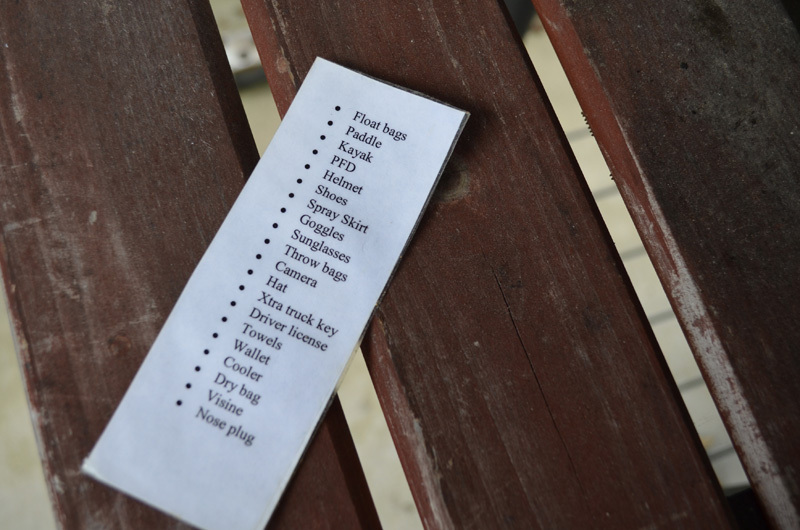 The image below is the list Teresa and I made when we first started whitewater kayaking. It saved the day plenty of times. Sure your friends may laugh at your Type A approach, but you won’t be the one who gets to the put-in to discover you left your PFD at home. Develop a routine. Get in the habit of making, well, habits. Repetition goes a long way in getting organized, eventually every task becomes second nature and you can do away with those pesky lists that your friends make fun of you for having. You will be amazed at how quickly your routines translate to efficiency, and the tasks you used to dread are done before you know it. An important routine to have is caring for your gear. 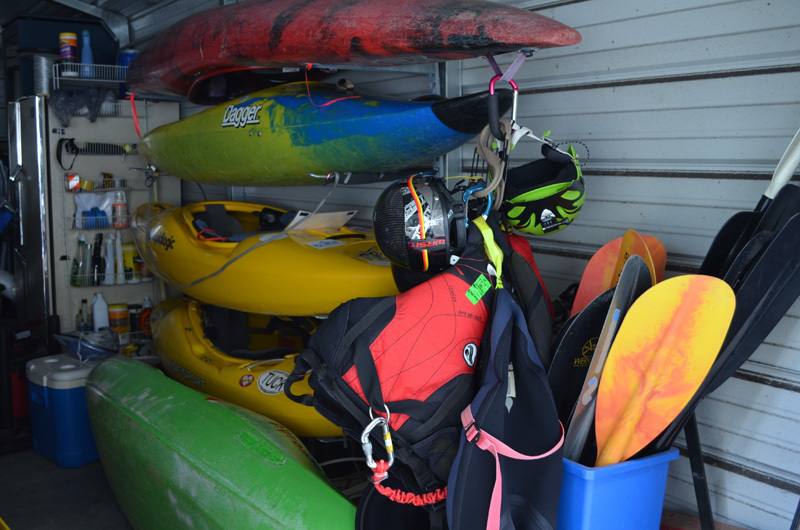 Thoroughly rinse, dry, and properly store your gear. The investment in all that equipment is substantial, and unless you’re made of money, taking care of it will prolong its life and your bank account. A place for everything, and everything in its place. Preparing for a trip is time consuming. Scrambling around, trying to remember where the heck you put your thingamabob is not only frustrating, it can be expensive if you misplace something and have to purchase it again. I’m sure most everyone can relate to this predicament, and not just in regards to kayaking! Designate a place for your gear and use it so you’ll know exactly where your thingamabob is every time. You can significantly reduce the amount of time it takes to get everything loaded for an outing if you practice good housekeeping. I can load all the gear for two people needed for a trip in less than 10 minutes. Designated place for all the essentials. Eliminates the futile search for that critical piece of equipment. The bootie rack. I put shoes here to dry after rinsing them out, and they’re right where I need them when it’s time to pack up for a trip. Find ways and tools to make it easier. 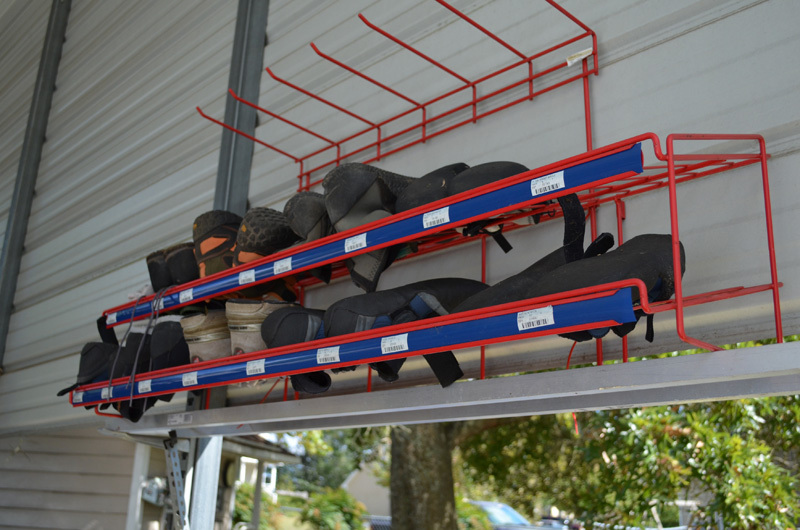 A few simple items from the hardware store can make your life so much easier. One of my favorite things is a big S-biner. 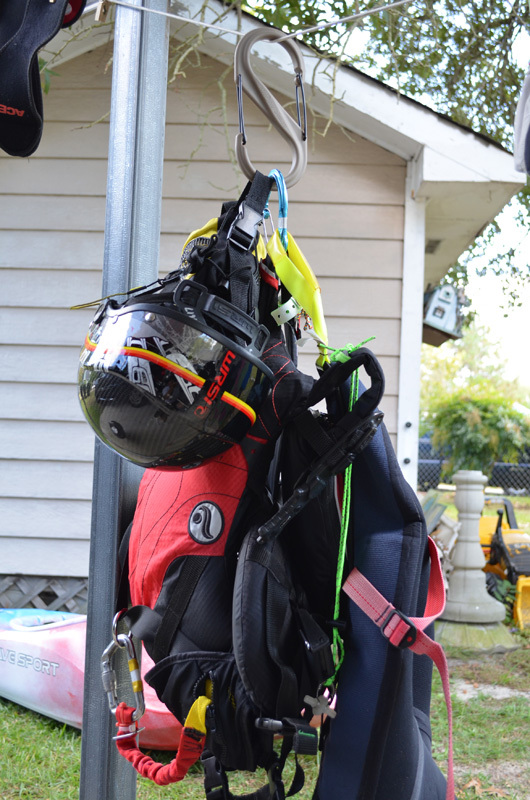 I clip all the essential gear I wear or carry in my boat (helmet, skirt, PFD, pin kit, throw rope) together. A nice large duffel bag is great for keeping things like paddling clothes, first aid kit, dry bag, change of clothes, towels, etc… Essentially everything I need for a trip that is valuable or doesn’t fare well being kept in uncontrolled conditions I keep in a duffel bag. Whenever it’s time to go paddling, I just grab it and go. Most of the prep time before a trip is now spent deciding what to pack for lunch and snacks. Keep it together. 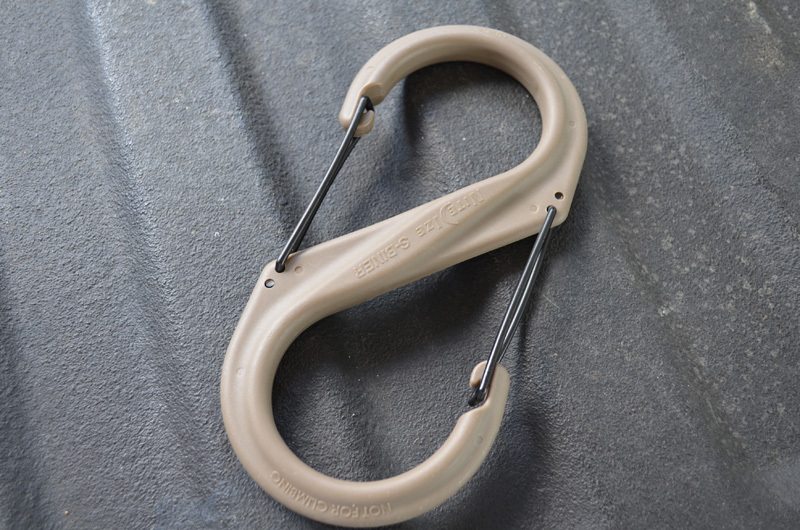 The added value of something like a large carabiner to keep your stuff together is how many ways it keeps everything organized. I clip everything I physically have to put on before getting on the river to the outfitting in my boat. I put on a cockpit cover to ensure I arrive at the put-in with all my gear. If weight is a concern and I have to use a duffel bag to carry my gear, it stays together nicely there also. After a trip, I clip my gear to the clothesline for drying, and later to the designated spot to hang by the boat rack. Even with careful preparation and planning, it is always wise to double-check everything. Have a friend ask if you have all your stuff. Inspect your gear to ensure it is still in good working order. I start packing for a trip at least a day beforehand, I like to get everything prepped and loaded the night before, when possible. I load boats and as much gear as possible because it is the most physically demanding part and requires absolute focus. Early morning departure times can be brutal. I enjoy being able to sip some coffee and leave with plenty of time to grab breakfast and get to the rendezvous point early. I don’t want to be in a panic to get everything loaded and properly tied down in the dark and early morning hours. A few minutes of pre-planning and organization can save you hours of time vs. trying to get organized at the last minute.